Unfortunately the two are often linked. Firstly let’s consider conversation and presentation. There are not many of us who have a problem with the art of conversation. Yes, there are undoubtedly some experts out there, but it isn’t something that concerns most of us. That’s because we know the rules. So we know what to expect and so do our co-conversationalists. But we also speak at an understandable pace and with a volume or tone that’s right. But when we take that same tone of voice into the presentation room then we run the risk of sounding monotonic and perhaps…dull? Why is this? There is a simple reason. The conversation style works when you are speaking in small groups with close proximity to one another. You don’t need and certainly don’t expect drama from your interlocutors. However a good contentious subject will result in some drama. But, speaking at the front of a seminar room there’s a distance between you and your audience. They aren’t your interlocutors. Therefore your face-to-face positioning is replaced with a group to individual stare. So the relatively flat conversational tone, fine for daily use is rendered inappropriate by the combination of distance and body positioning. This Alan Mulally presentation at Ford was pretty faultless. But, the monotone of his delivery didn’t help him. Distance and one-to-many stances amplify a conversational tone. Where it’s conversational on the front row, it’s definitely monotonic and without emphasis at the back. And that’s a problem when you want to seriously engage your public speaking audience. Of course, you can try to get closer to your audience. But no matter how close you are to the front row you are going to be further away from the second and third rows. And that’s a problem. A problem because it can not support a conversational tone. Of course there’s a better presentation solution. Introduce some drama and excitement into your voice. Inject your speech with added emphasis. So use louder words at key moments or lower and softer phrases at others. You should practise some exaggerated emphasis on either the first, middle or closing words in your sentences. Try to practise your presentation when you are on your own at first! It might seem strange to you. However, by the time your audience hears you it will be fine. Because the added emphasis and tonal variation that you introduce to your presentation will be greatly appreciated. 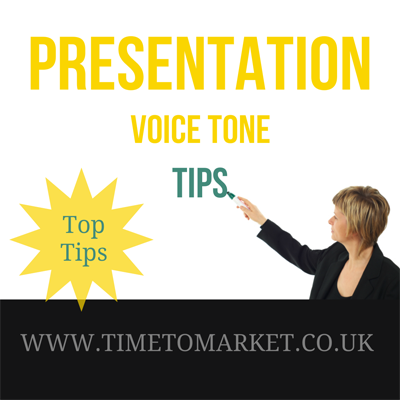 Work on your presentation voice so you can boost your presentation success. Use special emphasis in your voice. Introduce some tonal variation to your speech. Don’t forget to pause for effect. You can always attend a PresentPerfectTM presentation skills course to learn new presentation skills tips. So, when you are ready to boost your own presentation skills, please don’t hesitate to get in touch.